Cicala is rolling out dough for chestnut gnocchi, with the wild boar that’s to accompany it, which he got last minute from Angelo’s on 9th St., safe and secure—and already braised into a ragu—in the downstairs walk-in. “Cutting, prepping, and finding things from downstairs,” he says of his remaining tasks, waving a knife at an 8×5 prep list. “Of course this happens this weekend, but we knew it was coming,” Cicala says, cutting a long strand of dough into gnocchi. He’s referring to a visit by the heath inspector to certify his charcuterie room, which resulted in an unorganized rearrangement of his stock. While running the chestnut gnocchi—given a sepia hue by brown sugar, cloves, and cinnamon—across a grooved wooden board, he bemoans recently enacted legislation that he sees as both stricter and antithetical to old world curing methods. “We cure in the way of the Italians, which means you have more water activity. It makes for a softer cure, but by Philadelphia standards, it then has to have a lower ph. My ultimate goal is USDA standards, but that means I have to compromise a bit. It’s still delicious, but it’s not the same,” he says. A few feet away, pastry chef, and Cicala’s wife, Angela Ranalli is cutting pears for part of a massive dessert plate. “These will get two bottles of wine ahead of a 30-40 minute poaching. There’s some toasted pine nuts we’ll serve on the side. The pecorino [for panna cotta] was mixed with heavy cream and sugar. The wine will cook down and will mix with some of the pears’ sugars, and we’ll use that as a sauce,” Ranalli says. On the other end of the kitchen, Cicala sets a metal cylinder on the stove. He places seasoned lamb atop a grill rack resting upon the brim and turns the dial on long enough to send smoke drifting upwards from juniper chips before covering it with a metal steam table container. “I’m trying not to burn the fat,” he says. 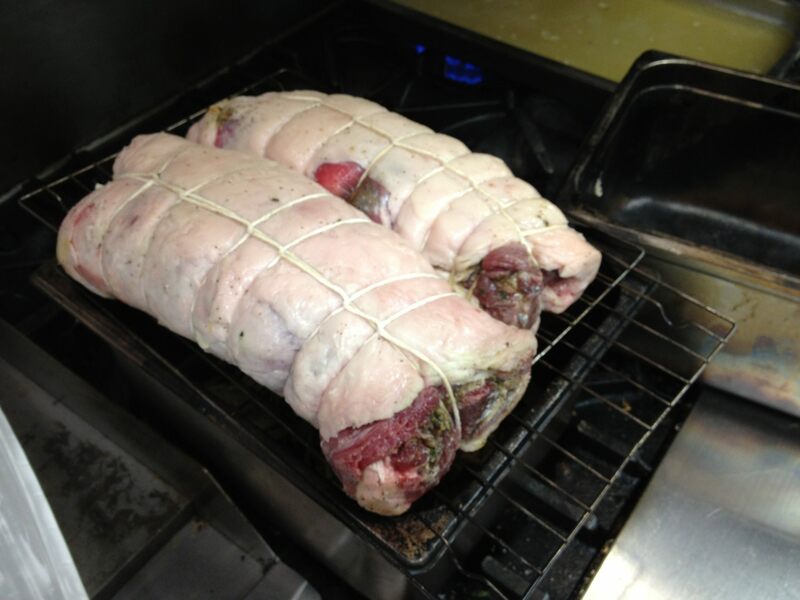 The lamb will sit in a cold smoke for 20 minutes ahead of being roasted in the oven. “I don’t need an oven till later—for a crustado,” Ranalli says to Cicala’s bit of thinking out loud. Leaving the lamb to smoke, he now has a whole duck on a serving tray on the main prep table. He runs his fingers across the surface, surveying the work ahead before picking up a set of pliers and taking out each little quill tip one by one. Lamb strip and loin wrapped with lamb belly being given a cold smoke. Courtesy Joe Cicala. It’s 11:45 and time is running out. The first guests are expected around 1:45, with the dinner slated to start at 2p.m. Fred Cretarola pops into the kitchen to inquire about adding more reservations. Cicala let’s out a weary sigh before acquiescing. They’re at over 40 reservations whereas last year, they served only 20. “That’s fine, I’m prepping for more than that just to be safe,” he says. I leave Cicala to the duck in order to get Ranalli’s perspective on the dinner. “It’s a lot of food that a lot of people aren’t used to, from a weird region way up in the mountains,” she says. Spent lemons lay in a pile as she drops zest into a mixture of simple syrup and lemon juice. Fresh basil will be added before freezing. For service, it will be scraped with a fork and drizzled with an extra virgin olive oil carrying delicate notes of pepper. “This is more along the coast, the Adriatic,” she says, offering another reminder of how much the region can vary, before adding that in the summer, they did an orange basil granita.